Purpose: Caffiene has long been known to be a stimulant as it causes increases in heart rate and blood flow. It is found in many different beverages such as coffee, tea and most sodas. 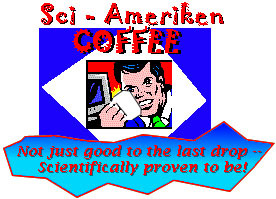 This week Scientific AmeriKen will examine the effects of caffiene on typing speed and accuracy. Scientific AmeriKen hopes that the experiment will provide valuable information for receptionist and people needing to crank out last minute term papers. stimulate the typist and will cause finger speeds to increase, that typing speed will increase, however, because typing will be occuring at a higher rate of speed, it is expected that the typist will become more inaccurate as the amount of caffiene increases. Equipment: Needed for this experiment is a program to record typing speed. The program used for this experiment was the Easy Working Typing Tutor (click examine this program). Also needed for this experiment was a pen and paper and a source of caffiene. Used in this experiment were 12 ounce sodas. Procedure: In the typing tutor, lesson 10 was used which features six, 30 second drills. The first step is to complete all 6 drills and record the words per minute (WPM) and accuracy percentage in each test. The next step is to drink 1 soda, wait 5 minutes, then repeat the same 6 test. Repeat this process 2 more times. Finally wait 30 minutes after the complete of the "after 3 soda" test and repeat all 6 test. The next day, repeat all 6 test one more time. Compare results for all test. Conclusion: Based on the results, it appears as though caffiene had an affect on typing speed, but not accuracy. This is based on the general increasing slope viewed on the first graph. The accuracy graph appears erratic. Since there seems to be no consistancy as the number of sodas polished off increases, then no conclusion can be made about accuracy. Furthermore, the effect noticed with typing speed may be more a result of familiarity with the test as opposed to an effect of the caffiene. This is supported by the test done after 30 minutes and the next day where WPM speeds were substantially increased. In conclusion, it appears the hypothesis was shown wrong in this experiment and caffiene, at least that from a soda, has had no serious effects on typing speed or accuracy.